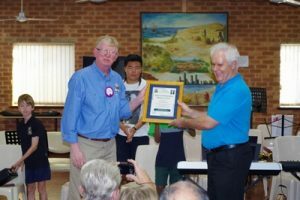 Phil Hatton has been presented with a James D Richardson Award for his tireless work and dedication to the youth music program with the Lions Club of South Perth. Phil took over as musical director, teacher and leader of the youth group in 2008. Since then he has expanded the program to some 30 students across three groups – beginners, intermediate (those that have some skill) and advanced. The club is indebted to Phil for his huge contribution to the program over the last 8 years.